So you've found your partner, your bridesmaids and chosen your dress? Now let's move on to finding the perfect bridal jewellery to compliment your look. Whether you're going for a traditional wedding gown or something with a twist, bridal jewellery should be kept subtle and classy with an air of elegance to allow your dress to take centre stage. 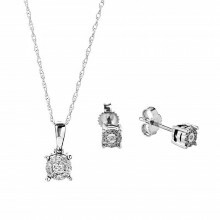 Keep it understated with a classic diamond pendant and matching earrings from our very own collection. The graceful hint of sparkle will compliment your look beautifully and a pair of diamond earrings will shine through no matter which hairstyle you've opted for. Alternatively, nothing says elegance and sophistication more than pearls. 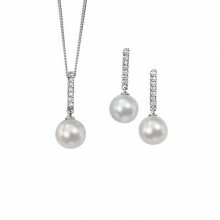 This gorgeous diamond and freshwater pearl pendant and separate earrings are from also from The Jewel Hut range. Diamonds and pearls never go out of style and the beauty of these pieces will last a lifetime. If you want to inject a touch of colour into your bridal look, our collection of fine jewellery features an array of precious and semi-precious gemstones. 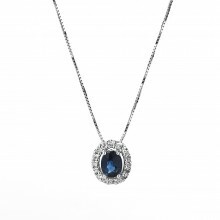 Rubies and emeralds are a sure-fire way of injecting some class into your look, or alternatively, take inspiration from the Duchess of Cambridge with this beautiful sapphire and diamond pendant and matching earrings. If your wedding dress features a high neck, you may want to give the necklace a miss and opt for a delicate bracelet instead. 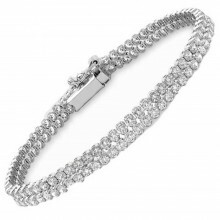 This beautiful 9ct white gold double row tennis bracelet is neutral and elegant and perfect for completing your bridal look. Alternatively, our branded jewellery collections also feature an impressive range of jewellery that can be worn for any special occasions. This gorgeous rose gold plated bracelet by Thomas Sabo is set with 12 dazzling cubic zirconias stones for a touch of sparkle reminiscent of diamonds for a fraction of the price. The key to nailing bridal jewellery is to keep it simple and sophisticated without going too overboard with statement pieces and daring colours, but of course, everybody has their own style and their own look that they wish to achieve. Browse our online collections today where you are sure to find just what you are looking for.